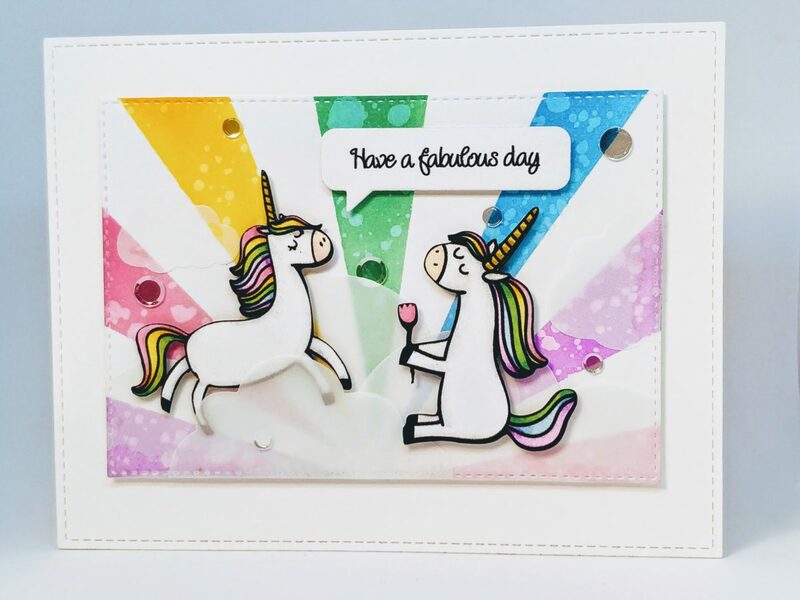 I’m back again with another unicorn project featuring Unicorn Farts from Beth Duff Designs. I seriously love this stamp set! This card was simple and pretty quick to create. I used several stitched rectangle dies to cut out my card front and the rainbow sky layer. The rainbow was easy to create. I cut several strips of painter’s tape into long triangles and created my own mask, then sponged on a rainbow of Distress Oxide ink. Water sprinkles helped to lift some of the color and add more texture. I die cut clouds from vellum and used my smaller stitched rectangle die again to cut the clouds down where they would hang off. I glued them onto the rainbow panel, then attached my unicorns with foam tape. I stamped my sentiment, die cut it with a speech bubble and attached it with foam tape. The panel was attached to the card front with even more foam tape. The card front was then glued onto an A2 card base. As a finishing touch, I added some Wink of Stella to the unicorn horns and flower. I also adhered a few clear sequins. This would be a fabulous birthday or thinking-of-you card. What occasion would you use it for?